AirAsia India: Aircraft utilisation crosses 10 hours with double daily Kochi, Hyderabad next? 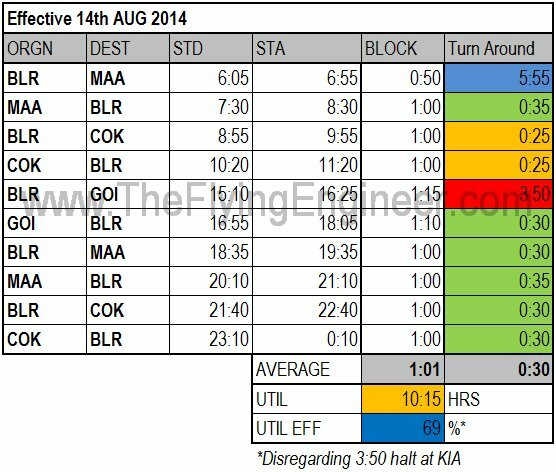 Double daily to Kochi: Aircraft utilisation crosses 10 hours per day (Aug 14th onward). Hyderabad seems like the next logical destination. Airline touches 25 minute turn around, timing though is baffling. AirAsia India announced the double daily to Kochi today with minimal publicity. The double daily is effective August 14th onward, and that is when the airline’s single aircraft, an A320 registered VT-ATF, will cross 10:00hrs of daily aircraft utilisation. When that happens, the average turnaround time will settle at 30 minutes, and the average block time of each flight will hover around 1 hour. The airline is yet to utilise the aircraft in the period between 11:20hrs and 15:10hrs: when the aircraft is on ground for almost 4 hours. Disregarding this time on ground, the aircraft’s present utilisation efficiency (total block hours against total time the airplane is used for operations) touches 69%. This number will increase if the aircraft is used on longer sectors, when the airplane spends more time in air. If the other flights in this pattern are to remain, then the aircraft can operate two 1:10hr block hour sectors in that near 4 hour period on ground. 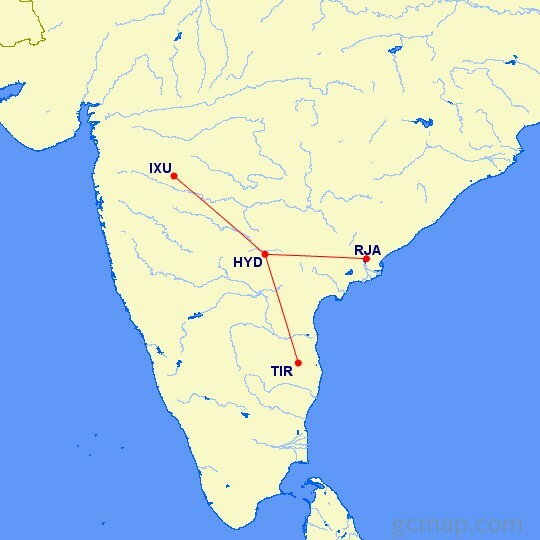 A 1:10hr block flight (see the green range circle in the adjacent map) is possible if the airline flies to one of the following cities: Vijayawada, Hyderabad, Belgaum or Hubli. Hubli’s airport runway is 5,500ft long, and can just meet the runway requirements for the A320. 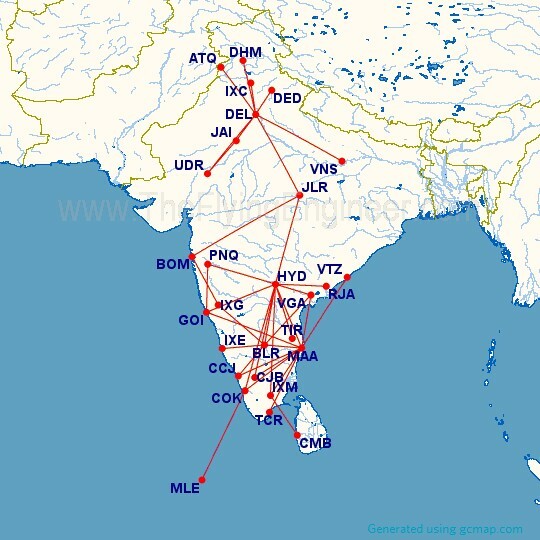 Alternately, the airline can fly sub-1:10 sectors, which include Madurai, Coimbatore, and Mangalore. Another interesting point is the timings of AirAsia India’s flights. For its Tier II destinations, AirAsia India’s flights do not compete with the competition. For example, between 12:30 and 13:00, there are three departures to Goa, operated by Indigo, SpiceJet, and Jet Airways, what may be considered the “peak” time for departures to the holiday destination Goa from Bangalore. 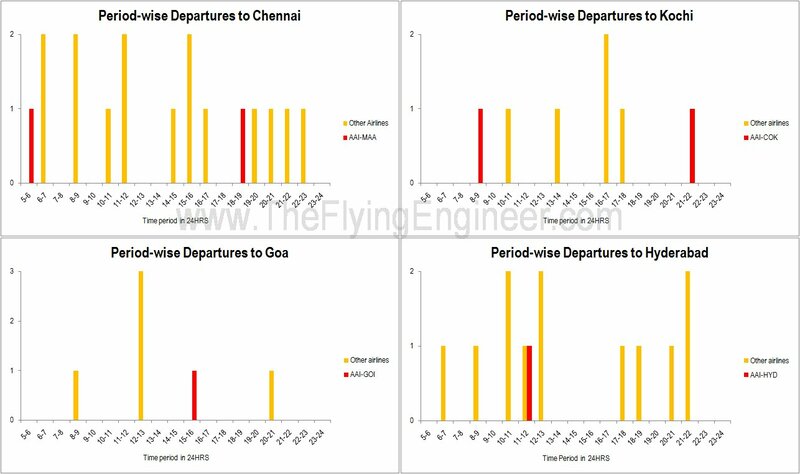 AirAsia India however fills a wide gap, as seen in the graph for the period wise departures to Goa. As for Kochi, the airline operates flights at times that are not served by other airlines, ensuring a comfortable day return for business passengers to Kochi. When it comes to the only Tier I city it serves out of Bangalore- Chennai-AirAsia India’s flights do not really fill a gap, but are timed to somewhat coincide with the “peak” timings-beating the early morning IndiGo flight by 20 minutes (and moved in the graph to the 5-6 slot for purposes of clarity although the departure is at 6:05hrs) and positioning itself well to offer another departure just before other airlines offer a string of departures in every time period between 19:00 and 23:00hrs. Loads, however, on the early morning Bangalore-Chennai vv run aren’t as great as the Goa loads, hovering at 65-70% only. It will only be prudent for an airline to now tap another relatively denser route. AirAsia India’s aircraft is on ground between 11:20hrs and 15:10hrs. With 30 minute turnarounds, the airline can operate a 11:50 departure to a destination to which the block time is 1:10, and operate the return at 13:30 from that destination. 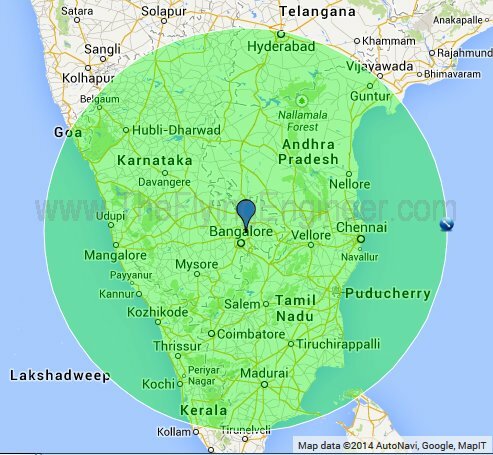 Of the four cities that are a block hour 1:10hrs away, Hyderabad seems lucrative as it is a Tier I route. Interestingly, a departure at 11:50 will coincide with the period which appears to be favourable for departures to Hyderabad. Between 10:00hrs and 13:00hrs, there are five departures to Hyderabad from Bangalore. No other period is as dense. 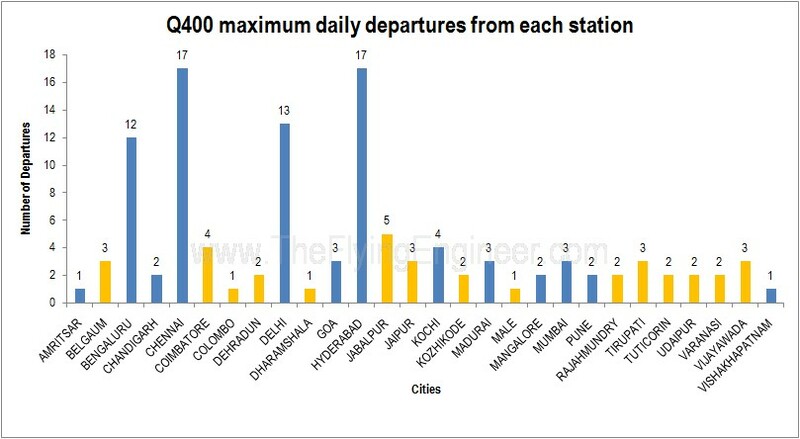 With this analysis, Hyderabad appears to be a good destination to fly to. Vijayawada, Hubli, and Belgaum may not have the loads for economically viable 180 seat airplane operations; such destinations are presently serviced by SpiceJet’s 78 seat Bombardier Q400s and AirCosta’s 67 seat Embraer E170. If Hyderabad ‘happens’, the airline’s sole aircraft’s utilisation will touch 12:35hrs: a very impressive figure considering Air Costa plans a maximum of 11:25hrs utilisation on its E170s, with 1 hour sectors (just like AirAsia’s sectors today) even with a 20 minute turn around. AirAsia manages this by starting operations one hour earlier and stopping two-and-a-half hours after Air Costa’s. The pattern for their single aircraft reveal some interesting data. At Cochin and Bangalore, the airline targets a 25-minute turnaround at Bangalore and Cochin between the Chennai and Cochin flights, and the Bangalore and Cochin flights. These are the only two turnarounds that are in line with AirAsia Group’s target of 25 minutes for domestic flights. 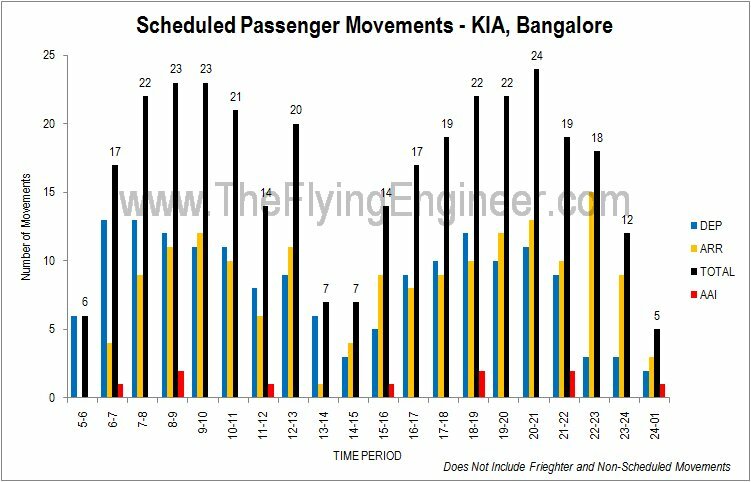 Interestingly, the 25 minute turnaround at Bangalore is planned between 8:30AM IST – 8:55AM IST: the peak period for aircraft movements at the airport, when chances for delays due to congestion are higher (look at the Bangalore airport traffic density in the graph on the right). 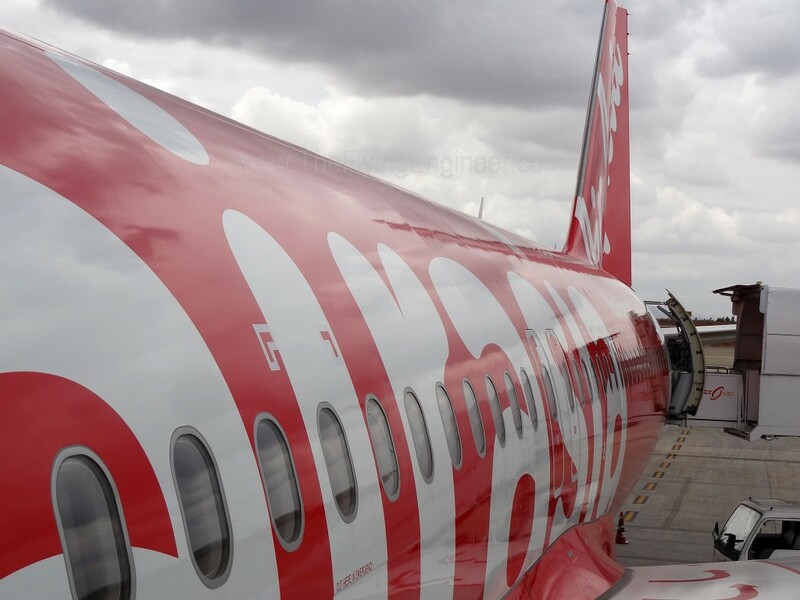 To facilitate a faster turnaround, AirAsia uses the aerobridges between flights: passengers are encouraged to deplane from the front (aerobridge) and the rear (stairs and then apron busses), while boarding is completed via the front entry only. To be able to consistently meet a very short turnaround target of 25 minutes, AirAsia must resort to a method of queuing passengers in the order of last seat first in, to allow the cabin to settle faster. The practicality of such an implementation is another matter of discussion.